Conventional IV amphotericin B is associated with a high incidence of adverse effects, and most patients who receive the drug experience potentially severe adverse effects at some time during the course of therapy. Acute infusion reactions (e.g., fever, chills, headache, nausea, vomiting) and nephrotoxicity are the most frequent adverse reactions to conventional IV amphotericin B. Although clinical experience with amphotericin B cholesteryl sulfate complex, amphotericin B lipid complex, and amphotericin B liposomal is limited to date, these drugs appear to be better tolerated than conventional IV amphotericin B. As with conventional IV amphotericin B, the most frequent adverse reactions to amphotericin B cholesteryl sulfate complex, amphotericin B lipid complex, or amphotericin B liposomal are acute infusion reactions; however, data accumulated to date indicate that lipid-based and liposomal formulations of amphotericin B may be associated with a lower overall incidence of adverse effects and a lower incidence of hematologic and renal toxicity than the conventional formulation of the drug. Acute infusion reactions consisting of fever, shaking chills, hypotension, anorexia, nausea, vomiting, headache, dyspnea, and tachypnea may occur 1-3 hours after initiation of IV infusions of conventional amphotericin B, amphotericin B cholesteryl sulfate, amphotericin B lipid complex, or amphotericin B liposomal. These reactions are most severe and occur most frequently with initial doses and usually lessen with subsequent doses. Fever (with or without shaking chills) may occur as soon as 15-20 minutes after IV infusions of conventional amphotericin B are started. The majority of patients receiving conventional IV amphotericin B (50-90%) exhibit some degree of intolerance to initial doses of the drug, even when therapy is initiated with low doses. Although these reactions become less frequent following subsequent doses or administration of the drug on alternate days, they recur if conventional IV amphotericin B therapy is interrupted and then reinstituted. In a study designed to evaluate the incidence of infusion reactions occurring in patients receiving conventional IV amphotericin B, 71% of patients had at least one infusion-related reaction during the first 7 days of therapy; fever and chills occurred in 28-51% and nausea and headache occurred in 9-18% of patients. In patients receiving amphotericin B cholesteryl sulfate complex, infusion reactions (i.e., chills with or without fever) have been reported in 35% of patients receiving the initial dose and in 14% of patients receiving the seventh dose of the drug. In patients receiving amphotericin B lipid complex, chills and fever have been reported in 14-18% of patients and nausea, vomiting, and hypotension have been reported in 8-9% of patients. In a large, double-blind study in adults and pediatric febrile neutropenic patients, infusion reactions (i.e., fever, chills/rigors, nausea, vomiting) occurred in 4-20% of those receiving the first dose of amphotericin B liposomal and 7-56% of those receiving the first dose of conventional IV amphotericin B. In a randomized study in HIV-infected patients with cryptococcal meningitis, infusion reactions (i.e., fever, chills/rigors, nausea, vomiting) occurred in 6-16% of those receiving amphotericin B liposomal (3 or 6 mg/kg daily) and 18-48% of those receiving conventional amphotericin B. There have been reports of flushing, back pain (with or without chest tightness), and chest pain occurring within a few minutes after initiation of IV infusions of amphotericin B liposomal; these reactions occasionally were severe but disappeared when the infusion was stopped.These symptoms do not occur with every dose and usually do not recur with subsequent doses given at a slower IV infusion rate. Although the precise mechanism for these infusion reactions is not known, limited evidence indicates that amphotericin-induced increases in prostaglandin (e.g., PGE2) synthesis may be involved. Acetaminophen, meperidine, antihistamines (e.g., diphenhydramine), or corticosteroids have been used for the treatment or prevention of acute infusion reactions in patients receiving conventional IV amphotericin or other formulations of the drug. It has been suggested that meperidine (25-50 mg IV) may decrease the duration of shaking chills and fever occurring in association with IV infusion of amphotericin B. While there is some evidence that IV administration of small doses of corticosteroids just prior to or during infusion of conventional amphotericin B may help decrease the severity of febrile and other systemic reactions and some clinicians suggest that 10-50 mg of hydrocortisone sodium succinate or methylprednisolone sodium succinate can be added to each IV infusion of conventional amphotericin B, corticosteroids should be used only when necessary using minimal dosage for as short a period as possible. (See Drug Interactions: Corticosteroids. )Use of a premedication regimen (e.g., acetaminophen and diphenhydramine; acetaminophen, corticosteroid, and diphenhydramine) is not routinely recommended prior to the initial dose of any amphotericin B formulation, but can be administered promptly to treat a reaction if it occurs and then as pretreatment prior to subsequent doses. Rapid IV infusion of conventional IV amphotericin B has been associated with a more severe reaction consisting of hypotension, bronchospasm, hypokalemia, arrhythmias, and shock. Some of these adverse effects also have been reported rarely with amphotericin B cholesteryl sulfate complex, amphotericin B lipid complex, or amphotericin B liposomal. It may be difficult to determine whether these severe reactions indicate intolerance or hypersensitivity to the drug. Nephrotoxicity is the major dose-limiting toxicity reported with conventional IV amphotericin B, and nephrotoxicity occurs to some degree in the majority of patients receiving the drug. Adverse renal effects in patients receiving conventional IV amphotericin B include decreased renal function and renal function abnormalities such as azotemia, hypokalemia, hyposthenuria, renal tubular acidosis, and nephrocalcinosis. Increased BUN and serum creatinine concentrations and decreased creatinine clearance, glomerular filtration rate, and renal plasma flow occur in most patients receiving conventional IV amphotericin B. In addition, hypokalemia and hypomagnesemia develop in a large proportion of patients, Uric acid excretion is increased and nephrocalcinosis can occur. Renal tubular acidosis may be present without concurrent systemic acidosis. It has been suggested that hydration and sodium repletion prior to administration of IV amphotericin B may decrease the risk of nephrotoxicity, and supplemental alkali therapy may decrease complications related to renal tubular acidosis. Nephrotoxicity associated with conventional IV amphotericin B appears to involve several mechanisms, including a direct vasoconstrictive effect on renal arterioles that reduces glomerular and renal tubular blood flow and a lytic action on cholesterol-rich lysosomal membranes of renal tubular cells. On biopsy, juxtamedullary glomerulitis and intratubular and interstitial calcium deposits in the distal nephron are found. Although renal function usually improves within a few months after discontinuance of conventional amphotericin B therapy, some degree of permanent impairment may remain in some patients, especially in patients who received a large cumulative dose of the drug or concomitant therapy with other nephrotoxic drugs. Patients with higher serum low-density lipoprotein (LDL) concentrations appear to be more susceptible to amphotericin B-induced renal toxicity than those with lower concentrations. Increased BUN and/or serum creatinine, hypokalemia, hypomagnesemia, and hypocalcemia also have been reported in patients receiving amphotericin B cholesteryl sulfate complex, amphotericin B lipid complex, or amphotericin B liposomal. While these formulations appear to be associated with a lower risk of nephrotoxicity than conventional IV amphotericin B and have been used in patients with preexisting renal impairment (in most cases resulting from prior therapy with conventional IV amphotericin B), additional experience with the drugs is necessary to more accurately determine the extent of nephrotoxicity that occurs with these formulations. In several studies when amphotericin B cholesteryl sulfate complex or amphotericin B lipid complex was substituted for conventional IV amphotericin B in patients who developed nephrotoxicity while receiving the conventional formulation and had baseline serum creatinine concentrations of 2 mg/dL or greater, serum creatinine concentrations generally declined during therapy with the lipid-based or liposomal formulations. In a randomized, double-blind study comparing safety and efficacy of amphotericin B cholesteryl sulfate complex and conventional IV amphotericin B in patients with normal renal function at baseline, increased serum creatinine concentrations occurred in both treatment groups but remained consistently lower in those receiving amphotericin B cholesteryl sulfate complex. In a randomized, double-blind study comparing safety and efficacy of amphotericin B liposomal or conventional IV amphotericin B for antifungal prophylaxis in febrile, neutropenic patients, nephrotoxicity occurred in about 19 or 34% of patients, respectively.In a randomized study in HIV-infected patients with cryptococcal meningitis, serum creatinine concentrations twofold higher than baseline concentrations were reported in 14-21% of those receiving amphotericin B liposomal (3 or 6 mg/kg daily) and in 33% of those receiving conventional amphotericin B. Other adverse renal effects that have been reported in patients receiving conventional IV amphotericin B, amphotericin B cholesteryl sulfate complex, amphotericin B lipid complex, or amphotericin B liposomal include anuria, oliguria, dysuria, decreased renal function, hematuria, urinary incontinence, renal tubular acidosis, and acute renal failure. Patients receiving conventional IV amphotericin B may develop normocytic, normochromic anemia. The anemia develops gradually and may not occur until after 10 weeks of therapy; it may be related either to a direct inhibition of erythrocytes or erythropoietin production or may be secondary to renal toxicity. The hematocrit rarely decreases below 20-25% and generally returns to baseline within several months following discontinuance of the drug. Anemia also has been reported rarely in patients receiving amphotericin B cholesteryl sulfate complex, amphotericin B lipid complex, or amphotericin B liposomal. Other hematologic effects, including agranulocytosis, coagulation disorders, decreased or increased prothrombin, thrombocytopenia, leukopenia, eosinophilia, or leukocytosis, have been reported rarely in patients receiving conventional IV amphotericin B amphotericin B cholesteryl sulfate complex, amphotericin B lipid complex, or amphotericin B liposomal. Various adverse cardiopulmonary effects, including hypotension, tachypnea, cardiac failure, cardiac arrest, cardiomyopathy, shock, pulmonary edema, hypersensitivity pneumonitis, arrhythmias (including ventricular fibrillation), dyspnea, and hypertension, have been reported in individuals receiving conventional IV amphotericin B. Bronchospasm, wheezing, hypoxia, angioedema, and anaphylaxis or anaphylactoid reactions have been reported in patients receiving conventional IV amphotericin B or the lipid-based or liposomal formulations of amphotericin B. An acute reaction consisting of lip swelling, breathing difficulty, and inability to move his left side was reported in one patient receiving an initial dose of amphotericin B cholesteryl sulfate complex, after about 50 mg had been administered; the patient previously had received amphotericin B lipid complex without experiencing such a reaction. While this acute reaction was described as an anaphylactic reaction, the manufacturer suggests that it most likely was an acute infusion reaction. If severe respiratory distress, anaphylaxis, or an anaphylactoid reaction occurs in a patient receiving amphotericin B, the drug should be discontinued immediately and the patient given appropriate therapy (e.g., epinephrine, corticosteroids, maintenance of an adequate airway, oxygen) as indicated. Following discontinuance of hydrocortisone and administration of oral potassium supplements, cardiac status returned to normal although conventional amphotericin B therapy was continued. In addition to the nausea and vomiting reported as part of acute infusion reactions to the drugs, other adverse GI effects have been reported in patients receiving conventional IV amphotericin B, amphotericin B cholesteryl sulfate complex, amphotericin B lipid complex, or amphotericin B liposomal. These adverse effects include anorexia and weight loss, diarrhea, dry mouth, stomatitis, dyspepsia,cramping, epigastric pain, hemorrhagic gastroenteritis, GI hemorrhage, hematemesis, and melena. IV administration of conventional amphotericin B, amphotericin B cholesteryl sulfate complex, amphotericin B lipid complex, or amphotericin B liposomal may cause erythema, pain, or inflammation at the injection site. Phlebitis or thrombophlebitis has been reported with conventional IV amphotericin B. The manufacturer of conventional IV amphotericin B and some clinicians suggest that the addition of 500-1000 units of heparin to the amphotericin B infusion, the use of a pediatric scalp-vein needle, or alternate-day therapy may decrease the incidence of thrombophlebitis. Extravasation of the drug causes local irritation. Adverse neurologic effects that have been reported in patients receiving conventional IV amphotericin B, amphotericin B cholesteryl sulfate complex, amphotericin B lipid complex, or amphotericin B liposomal include malaise, depression, confusion, dizziness, insomnia, somnolence, coma, anxiety,agitation, nervousness, abnormal thinking, hallucinations, tremor, seizures, myasthenia, hearing loss, tinnitus, transient vertigo, visual impairment, diplopia, peripheral neuropathy, encephalopathy, cerebral vascular accident, extrapyramidal syndrome, and leukoencephalopathy. Adverse musculoskeletal effects, including generalized pain, dystonia, and muscle, bone, or joint pain, have been reported in patients receiving conventional IV amphotericin B, amphotericin B cholesteryl sulfate complex, amphotericin B lipid complex, or amphotericin B liposomal. Rash (including maculopapular or vesiculobullous rash), purpura, pruritus, urticaria, sweating, exfoliative dermatitis, erythema multiforme, alopecia, dry skin, and skin discoloration or ulcer, have been reported in patients receiving amphotericin B. Increased serum concentrations of AST (SGOT), ALT (SGPT), alkaline phosphatase, bilirubin, Gamma-glutamyltransferase (GGT, γ-glutamyltranspeptidase, GGTP), and LDH have been reported in patients receiving conventional IV amphotericin B, amphotericin B cholesteryl sulfate complex, amphotericin B lipid complex, or amphotericin B liposomal. Acute liver failure, hepatotoxicity, hepatitis, jaundice, hyperglycemia, and hypoglycemia have been reported rarely. Intrathecal administration of conventional amphotericin B has produced headache, nausea and vomiting, urinary retention, pain along lumbar nerves, paresthesia, vision changes, and arachnoiditis. Initial doses of conventional IV amphotericin B, amphotericin cholesteryl sulfate complex, amphotericin B lipid complex, or amphotericin B liposomal should be administered under close clinical observation by medically trained personnel. The fact that acute infusion reactions (e.g., fever, chills, hypotension, nausea, vomiting, headache, dyspnea, and tachypnea) often occur 1-3 hours after initiation of amphotericin B IV infusions (especially after the first few doses) and that severe reactions including anaphylaxis have been reported rarely should be considered. IV amphotericin B is associated with a high incidence of adverse effects and should be reserved principally for the treatment of progressive, potentially life-threatening fungal infections caused by susceptible organisms when the potential benefits of the drug outweigh its untoward and dangerous side effects. Renal, hepatic, and hematologic function should be monitored in patients receiving conventional IV amphotericin B, amphotericin B cholesteryl sulfate complex, amphotericin B lipid complex, or amphotericin B liposomal. Some clinicians suggest that renal function be monitored at least 2-3 times weekly during initial amphotericin B therapy and that hepatic and hematologic function be monitored 1-2 times weekly. Serum electrolytes (especially potassium and magnesium) and complete blood cell counts (CBCs) also should be monitored in patients receiving any of these drugs.Because of the drug’s nephrotoxic potential, conventional IV amphotericin B should be used with caution in patients with reduced renal function and patients receiving any amphotericin B formulation concomitantly with a nephrotoxic drug should be closely monitored. 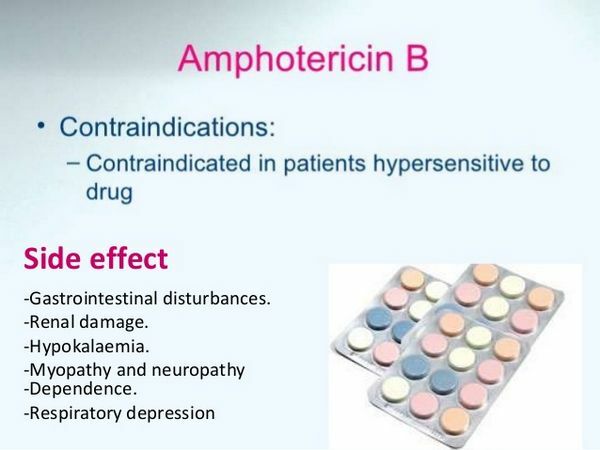 Conventional amphotericin B, amphotericin B cholesteryl sulfate complex, amphotericin B lipid complex, and amphotericin B liposomal are contraindicated in patients who are hypersensitive to amphotericin B or any other component in the respective formulation. The manufacturers of amphotericin B cholesteryl sulfate complex and amphotericin B liposomal suggest that use of these drugs can be considered in patients with hypersensitivity if the clinician determines that the benefits of such therapy outweigh the risks; however, they are contraindicated in patients who have had severe respiratory distress or a severe anaphylactic reaction while receiving the drugs. 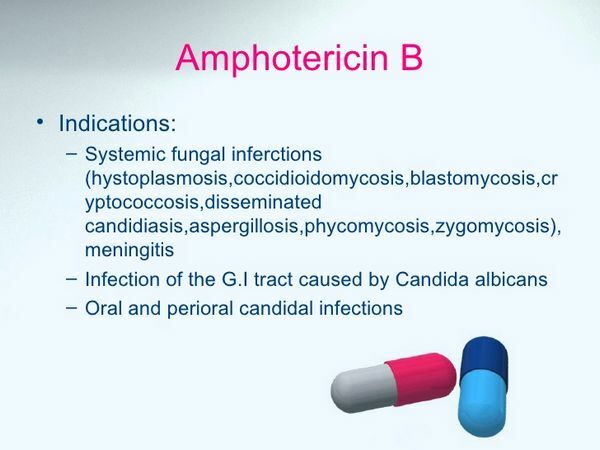 While safety and efficacy of conventional amphotericin B in pediatric patients have not been established through adequate and well-controlled studies, the drug is used effectively to treat systemic fungal infections in pediatric patients without unusual adverse effects. The manufacturer states that the lowest effective dosage of the drug should be employed whenever conventional IV amphotericin B is used in pediatric patients. No unusual adverse effects have been reported to date in pediatric patients who have received amphotericin B cholesteryl sulfate complex for the treatment of systemic fungal infections in dosages similar to those used in adults. In a study evaluating the safety and efficacy of amphotericin B cholesteryl sulfate complex and conventional IV amphotericin B in pediatric patients younger than 16 years of age, renal toxicity (serum creatinine doubled or increased 1 mg/dL or more from baseline or calculated creatinine clearance decreased 50% or more from baseline) occurred in 12% of those receiving the lipid-based formulation and 52% of those receiving the conventional formulation of the drug. 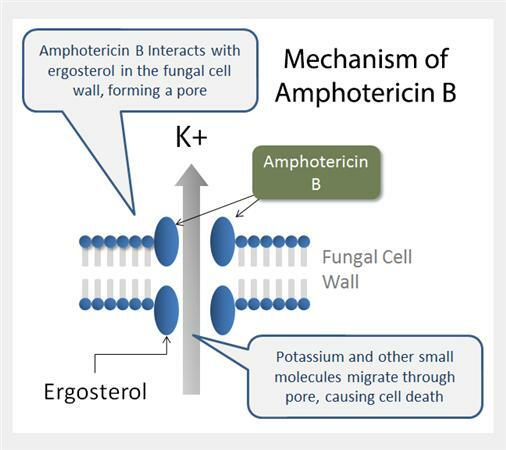 Amphotericin B lipid complex generally is well tolerated in pediatric patients, and has been used for the treatment of invasive fungal infections in children 3 weeks to 16 years of age without unusual adverse effects. Acute infusion reactions (fever, chills, rigors) and anaphylaxis have been reported in pediatric patients receiving amphotericin B lipid complex and have necessitated discontinuance of the drug in these patients. Amphotericin B liposomal has been administered to pediatric patients 1 month to 16 years of age without any usual adverse effects. Although safety and efficacy of the drug in neonates younger than 1 month of age have not been established to date, amphotericin B liposomal has been used in a limited number of neonates for the treatment of severe fungal infections without any unusual adverse effects. Transient hypokalemia that responded to potassium supplementation was the only adverse effect reported in a group of neonates who received amphotericin B liposomal in a dosage of 1-5 mg/kg given by IV infusion over 0.5-1 hours. In a large, double-blind study comparing the safety and efficacy of amphotericin B liposomal and conventional IV amphotericin B, the incidence of chills, vomiting, hypokalemia, or hypertension in patients 16 years of age or younger ranged from 10-37% in those receiving amphotericin B liposomal and from 21-68% in those receiving the conventional formulation of the drug. While safety and efficacy of conventional IV amphotericin B, amphotericin B cholesteryl sulfate complex, amphotericin B lipid complex, and amphotericin B liposomal have not been studied specifically in geriatric patients, no unusual age-related adverse effects have been reported when the drugs were used in patients 65 years of age or older. Although clinical experience to date indicates that dosage modification is unnecessary when amphotericin B liposomal is used in geriatric patients, the manufacturer recommends that these patients be carefully monitored while receiving the drug. There have been no long-term studies to date to evaluate the carcinogenic potential of conventional amphotericin B, amphotericin B cholesteryl sulfate complex, amphotericin B lipid complex, or amphotericin B liposomal. The mutagenic potential of amphotericin B liposomal has not been evaluated to date. There was no evidence of mutagenicity when conventional amphotericin B, amphotericin B cholesteryl complex, or amphotericin B lipid complex was evaluated using in vitro studies (e.g., bacterial reverse mutation assay, mouse lymphoma forward mutation assay, CHO chromosomal aberration assay) or in vivo studies (e.g., mouse bone marrow micronucleus assay) with or without metabolic activation. Safe use of amphotericin B during pregnancy has not been established. Conventional IV amphotericin B has been used to treat systemic fungal infections or visceral leishmaniasis in a limited number of pregnant women without obvious adverse effects to the fetus. While reproduction studies in rats and rabbits using conventional amphotericin B, amphotericin B cholesteryl sulfate complex, amphotericin B lipid complex, or amphotericin B liposomal have not revealed evidence of harm to the fetus, rabbits receiving amphotericin B liposomal dosages equivalent to 0.5-2 times the usual human dosage experienced a higher rate of spontaneous abortions than the control group. However, animal reproduction studies are not always predictive of human response. There are no adequate or controlled studies to date using any amphotericin B formulation in pregnant women, and these drugs should be used during pregnancy only when clearly needed. There have been no studies to date to determine whether conventional amphotericin B or amphotericin B cholesteryl sulfate complex affect fertility. Studies in male and female rats using amphotericin B lipid complex at doses up to 0.32 times the usual human dose (based on body surface area) indicate that the drug does not affect fertility. When liposomal amphotericin was administered to rats in 10- or 15-mg/kg doses (equivalent to human doses of 1.6 or 2.4 mg/kg based on body surface area), there was evidence of an abnormal estrous cycle (prolonged diestrus) and decreased number of corpora lutea in female rats receiving the higher dosage but no effect on fertility or days to copulation; there were no effects on male reproductive function. Because many drugs are excreted in human milk and because of the potential for serious adverse reactions to amphotericin B in nursing infants if it were distributed, a decision should be made whether to discontinue nursing or the drug, taking into account the importance of the drug to the woman.